Today is, of course, Easter Sunday. I believe I could safely say that it is the greatest day in Christendom, a day of joy and celebration for those who call themselves followers of Jesus. Even for nominal Christians( whatever that means) and those who have no connection to church, it is often that one Sunday each year when they make their pilgrimage to church. I have often heard that practice described as people thinking they are doing God a favor by dropping by. Thanks to the wonders of technology I knowe that I have one of my children and her family attended Easter services today and had quite a good experience and another made it to their first Easter Sunrise service and also had good experience, I know, without officially knowing, that almost all and probably all of my extended family ( sisters, brothers-in-law, sisters-in-law,etc) attended church today, the churches they attend on a regular basis. So,who am I leaving out in the above description? Alas, that would be yours truly. Yep, I had every intention of going today. I wasnt going to make the sunrise service since that would have required a 5:00 am wake up call. But the church we started attending recently offered several options left no good excuse. Sad to say, I still did not make it. The day that is most glorious and offers us hope beyond measure became a day in which I did not take part. Somewhat ironically even technology failed me. I found ” our” services online streaming live. So at least I would be able to take part to some extent. But, alas, my computer chose to show its unseemly self and froze twice during the broadcast, leaving me bereft of that option as well. All of this is certain to leave one at a loss. Next Sunday will not be Easter and the atmosphere will be different but once again I will have the opportunity to join a community of faith. It isn’t actually a ” do-over” but it is still awonderful opportunity to have. After all, if we sing the Don Francisco song, “He’s Alive” today, it will be no less true next Sunday. Most of those who serve do so at their own expense or through the generosity of others. On August 5, a 10 member team plus an Afghan driver was returning to Kabul after an arduous 2 weeks working in the remote Parun valley. Initial reports said they were surrounded by armed Taliban and brutally murdered by gunfire and hand grenades. As further information emerges, it appears that the act could have been perpetrated by armed bandits. It’s possible the truth will never surface or if so, not for some time. I would also doubt whether those responsible will ever be brought to justice. Other team members were dentist Thomas Grams of Durango, Co, nurse Glenn Lapp of Lancaster, Pa and an interpreter from Germany Daniela Beyer. The Afghans killed were Mahram Ali, a guard and a young cook named Ahmed Jawed. Certainly all had calculated the risks involved and chose to take those risks. Beyond the incalculable losses felt by the families and friends are the heavy toll on IAM’s work. At the least, much of it is in limbo. The attack was one of the worst carried out on foreign aid workers in many years. Heartfelt prayers go out to those impacted by these losses, especially those closest to these who gave their all. These were, in essence, the closing words from the 1977 made for television movie, Jesus of Nazareth. Having seen it a number of times in its entirety, and the resurrection section even more often, I still consider the best video presentation of the life of Jesus. The production was directed by Franco Zeffirilli and starred Robert Powell as Jesus along with other more notable actors such as Olivia Hussey( Mary) Ernest Borgnine, Anne Bancroft, James Earl Jones, Rod Steiger ( a great Pontius Pilate) and Michael York ( John the Baptist) among others. It was a two-part series that was annually aired every Easter for a number of years. I appreciated the reverence with which it was done as well as its faithfulness to the biblical record. But now the title quote. It was spoken by an extrabiblical character,an official of the Jewish temple. It was made in response to the reports that Jesus was not in the tomb. As best I remember, his character was a skeptic, but all the same, he knew something earthshaking had happened and things would never be the same. His statement is not a bad response to the sermon title I saw this week on a local church sign, ” What does Easter mean to you? ” Yep, and so it began and so it continues today! Sort of staying with the Saturday theme, this will approach the topic from a different perspective and maybe a more positive one at that. The place is Winston-Salem,NC or rather a part of that city known as Old Salem where an old tradition will take place on Easter Sunday, April 4. It is a tradition that goes back to 1771, predating the birth of these United States. 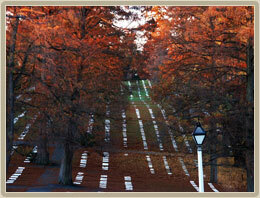 This tradition is the Easter Sunrise service in a place known as God’s Acre. In German the term is Gottesacker or field of God. It is actually a burial ground for Moravians who lived in Winston-Salem. The site is organized by choirs; all married men buried together, all married women buried together and so on. The site is the focal point for an annual sunrise service attended by thousands every year.My wife and I have atended twice. Our first visit was as really young married couple while the second wasas chaperones for a rambunctious but wonderful group of young people who still have a special place in our hearts. Both times the service was quite moving and seemed to fill us with a great sense of awe and reverence. In spite of the crowds there was very little noise other than the musical communication between the groups of strategically positioned Moravian musicians. Since the service is a “sunrise” service, one obviously has to arise rather early, to make a bit of a sacrifice compared to one’s normal routine. That plus the locale plus the local history of over 200 years added to the fact that this is one incredible event that one is celebrating made our two trips very, very unique and worshipful. I had actually attended a sunrise service around 10 years earlier while still in high school. That event was also very special but presented me with a unique “gift” that I have kept to this day. At that service I was stung by some type of insect and came oh so close to going into anaphylactic shock. Yep, that is when I developed my allergy to bee venom, an affliction that I still have some 40+ years later. So, if you have never had the blessing of attending a sunrise service, I encourage you to avail yourself of that opportunity this Easter season. And, some day, I hope you make the trek to Old Salem for this event will show you that our Moravian friends are known for much more than their culinary talents. Had to step away from the health care fiasco for a bit although I guess this may end up being related somehow or the other. One of my fellow bloggers did a great job raising issues and points of concern of which you may be unaware. So check out warrantonegirl for some good info. Back to our regularly scheduled blog. For the uninitiated, the title refers to cemeteries. I had not heard the term until a co-worker identified where he lived as being across the street from the boneyard. Rather apt term, come to think of it. I actually grew up just a block or two from our local boneyard in Eden, nee Leaksville, NC. The name is Lawson Cemetery, the name of the street on which I lived. I know very little about the place other than it has always been there( since 1843 I learned) and it was the final earthly resting place for both of my parents. I was always intrigued by the place as a child with all the different tombstones and grave markers and how old I thought they were, little did I know how true that was. So why boneyards? I suppose with the onset of spring and the approach of Easter I have ben thinking about such issues. I typically read and re-read the Gospel narratives (Matthew,Mark,Luke and John) about Passion Week that of course culminates in Jesus resurrection. There will be a time a bit later for more about that subject. But, strictly from a boneyard aspect, I remember teaching a high school age Sunday School class many years ago on the above topic and discovering that in New Orleans and in Israel ( not sure where else) that people had to be buried above ground due to those areas being largely below sea level. Not sure if the class was as fascinated with that trivia as was I .
I have noticed since my arrival in the northeastern corridor of our state that not all boneyards are like that of my childhood. There is a plethora of small, family plots in some of the most unlikely places. Usually there are just a handful of graves, often barely marked and separated from a busy highway by virtually no barrier at all. But, ahh the history that lies in these small plots, gradually but inexorably fading away. The devastation in Haiti is almost incomprehensible to those of us watching on television. Former NBA player Alonzo Mourning, who is there hard at work says that the pictures do not come close to accurately portraying the magnitude of what has happened. So much tragedy and loss of life in a country that was already suffering. Even people who were there providing through the United Nations and other agencies became victims themselves. Many will go, but most of us cannot. We can give as we are able and in so doing enable other to provide desperately needed assistance. Choose wisely the recipient of your donation, preferably one with whom you are familiar and who has a proven track record. The Red Cross is a great option as is Samaritan’s Purse, located in Boone, NC and ably directed by Franklin Graham. One interesting thing I noticed is the president announcing that the United States fund-raising effort will be jointly led by former presidents Bill Clinton and George Bush. That to me is a unique and wonderful feature of our style of government. I commend them both for their willingness to serve. Oh, by the way. There are elements of the media that are almost inexorably comparing Obama and Haiti with Bush and Katrina. Ignore it if you can because it is totally unnecessary and misguided. Pray for those who suffer and those who seek to aid them. I could have a bit of fun with the title, but no,it has little if anything to do with sports or a law firm or politics. It refers to pastors, from my first to my current. You can learn quite a lot about my current pastor who is listed on my blogroll. And I would invite you to do do. As for the others, that will take a little time and space. I have only referred briefly to my various pastors but thought it might be interesting to do so in more depth. First, some general info and guidelines. The term pastor refers to men who led a church that we attended or I attended as members. As has been the case in recent years we have not officially joined the churches we have regularly attended but these pastors still make the grade. I was interested to note that there are 11 names but 12 people on my list, on e being there twice, like Grover Cleveland. With the exception of the last 2, all were older than I when I was under their ministry. Several came from Tennessee(don’t know what that says) and a couple from South Carolina. One played minor league baseball and one has an inexplicable attachment to the Detroit Tigers. Two were independent Baptists, two were Assembly of God, six were Southern Baptist and one was non-denominational. I have learned and grown spiritually under most of them, some more than others. I counted two of them as very dear friends, each of which was a minister to me in a difficult time of life. I owe a spiritual debt to each of these individuals . Having said that, I will attempt to explore in the coming days what I have gleaned from these men and what I think one should realistically expect from ones pastor. With all we here about Iraq and have heard for the last several years, one place we that somehow flies under the radar is Babylon. This blog made its most recent “visit” to Babylon about 4 months ago and so it seemed time for an update. Today was a day for major celebration in Baghdad and other Iraqi cities as Iraqi forces took over significant responsibilities that had been held by American forces for some time. So in consideration of these events, what is happening in the former capital city, that was once the most important city in the world? Once again, we start with Joel Rosenberg and move to an article in yesterday’s Stars and Stripes which gives some truly fascinating detail. Seth Robson wrote an article entitled U.S.,Iraqi experts developing plan to preserve Babylon, build local tourism industry. The article discusses how soldiers of the 172nd Infantry Brigade are exploring the ruins of the ancient city as part of a joint U S -Iraqi effort to preserve the are and prepare it to be a tourist destination. US tourism experts Gina Haney and Jeff Allen just made their first visit in their capacity as the State Department’s site managers/developers. Numbers in the millions of visitors per year are envisioned. Admittedly this will take time and money, of which the latter is poised to return to Iraq in a big way. There has even been a recent story from Taiwan about tours that have already begun in order to to watch the city’s rebuilding up close and personal. Very, very interesting stuff and well worth keeping an eye on. I cannot help but wonder what the Old Testament prophet Daniel would have thought of this. During his campaign and now into his Presidency, Barack Obama has received what some might call an inordinate or even unseemly amount of praise and adulation. In fact, on February 23 of this year, there was a speech made in Toronto by Denver archbishop Charles Chaput. He warned against ” a spirit of adulation bordering on servility” towards the Obama administration. His speech made a number of positive comments about the President, calling him a ” gifted man” but reminding his audience that in America we elect “public servants” not ” messiahs”. I think that the Denver Archbishop’s words can take on even more meaning when we examine some recent developments. For example try out this painting from artist Michael D’ Antuono which will be unveiled on April 29 at New York City’s Union Square. Now even without comment this is a striking image sure to generate reaction. The artist has even chosen a somewhat provocative title, ” The Truth” for his work. Now, hear some comments from the artist. He says that the painting “is a politically, religiously, and socially-charged statement on our nation’s current political climate and deep partisan divide that is sure to create a dialogue” . I will agree most assuredly with the latter part of that phrase. He goes on to invite emails from the public, answering the question, ” What’s your truth” ?